A memorial page for Jake Ward has been created on EAAvesdropping, the EAA’s blog, eaavesdropping.blogspot.com. April 13, 1912, might have seemed a day like any other to the Emory community (centered those days in Oxford), but in the years and decades to come, it would prove a date of utmost importance in the University’s history. April 13, 1912, was the day Judson C. “Jake” Ward 33C 36G was born. In all, Ward, who held the position of dean of alumni since 1985, spent more than eighty years in the Emory community as a student, teacher, administrator, and spiritual leader. His passing on November 1 at the age of ninety-seven was met with an outpouring of affection that began with deep sadness but quickly turned into a celebration of the generous life of the man and his contributions to a community he helped build. Ward was born and raised in Marietta, Georgia. His father worked as a grocer, but his mother, Bertie Arnold Ward, had ambitions beyond the family business for Jake and their two other children, Bill and Hazel. Upon completing high school, Ward enrolled at Emory (which chartered the Atlanta campus in 1915) and pursued a bachelor’s degree in history. Ward’s years in Fitzgerald were very happy ones. He became deeply involved in the community—he taught Sunday school and sang in a men’s chorus at the First Baptist Church; he helped out with the scout troop; cofounded the town’s Lions Club; and spoke frequently around town. During that time, he also completed work for a master’s degree, which Emory granted him in 1936. Although Ward enjoyed life in south Georgia, he longed for a return to higher education and in 1937 moved to Chapel Hill to pursue a PhD in history at the University of North Carolina. Two years later, prior to completing his degree, Ward moved back to teach at South Georgia Teachers College, Statesboro, and then to Alabama for a teaching position at Birmingham-Southern College. Like all Americans, Ward’s life and priorities changed following the Japanese attack on Pearl Harbor, December 7, 1941. He was drafted into the U.S. Army, where he was quickly promoted to 2nd lieutenant in field artillery. After serving at Fort Bragg, Ward was transferred to the U.S. Military Academy at West Point, New York, where he taught cadets history, political science, and, in the summer, field artillery. The transfer to West Point proved a fortuitous event for Ward as that was where he met Susan-Jane Weyant, who would become his wife. The two were married on April 3, 1946, and the following June, after Ward completed his military service, the couple returned to Georgia. Ward set to work finishing his dissertation on the history of Georgia during the period following the Civil War and, within a year, was granted a PhD by UNC-Chapel Hill. Shortly thereafter Ward was named president of South Georgia Teachers College (now Georgia Southern) at Statesboro. However, the following April, the chancellor of the University System of Georgia transferred Ward to the position of assistant chancellor. 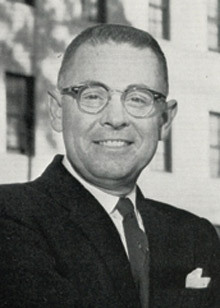 Then, late in 1948, Ward returned at last to Emory as dean of the undergraduate liberal arts college and a professor of Georgia history. In 1957, he was promoted to vice president and dean of faculties, the position in which he remained until he retired in 1979. Ward accomplished much during his time as an Emory administrator. He oversaw the admission of women to all schools of the University and later the admission of the first African American student. He also served as the teacher of Glenn Memorial United Methodist Church’s “Couples Class,” a couples’ bible study group that would eventually be renamed the Judson C. Ward Class in honor of his thirty years of teaching it. After retiring, Ward briefly served as the director of the Atlanta Historical Society before resigning from the position to teach history in the Oglethorpe Evening Courses for Credit program. 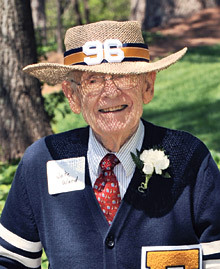 In 1984, Ward returned to Emory once more and took on the volunteer position of overseeing the Emory Alumni Association’s (EAA) alumni travel program. The following year, when Dean of Alumni H. Prentice Miller 27C 28G passed away, Ward stepped into the position, where he remained for the rest of his life. With Ward’s passing, the University is retiring the deanship. Ward frequently met with alumni when they visited the Miller-Ward Alumni House (MWAH) and answered every letter alumni wrote him. Beginning in 2006, he led the gold-robed members of Corpus Cordis Aureum (“The Golden Corps of the Heart”), Emory’s special group of alumni from fifty years ago and earlier, onto the Quadrangle for Commencement. And twice a year Ward hosted Jake’s Open House, a gathering that brought hundreds of guests to the Miller-Ward Alumni House to celebrate his birthday (in the spring) and Halloween (in the fall). Ward’s honors at Emory are too many to list—one of the most recent is the creation of the Judson C. Ward Consecutive Giving Society, which was established in 2006. The society provides special acknowledgment to long-term donors and brings distinction to individuals who support Emory though annual giving. Ward himself had a record of at least forty consecutive years of giving, which is as far back as tracking goes. 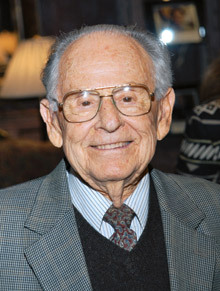 Emory said goodbye to Ward at a University-wide memorial service at Glenn on November 4. Jake Ward is survived by his wife, Susan-Jane, four children (Peter, Mike, Becky, and Jonathan), five grandchildren (Jennifer, Judson III, Andrew, Amanda, and Ansley), and two great-grandchildren, Grace Elizabeth and Brooke Elizabeth.